There is a dearth of literature and training experiences on the use of hypnosis in the treatment of alcohol abuse/problem drinking, drug abuse, and gambling. Most of the work done ith hypnosis for addictions focus on smoking and weight loss programs. Many of the techniques and strategies incorporate a variety of therapeutic modalities, including: cognitive-behavioral techniques, reframing and other NLP techniques, systematic desensitization, covert sensitization, 12-step-programs, guided imagery and meditation, and more. The techniques described can be employed both in and out of trance. “This is the book I’ve been waiting for. 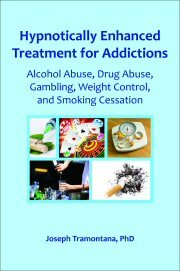 Dr. Tramontana has distilled his years of experience as a psychologist and hypnotherapist to create a concise guide that every therapist will want to use to enhance his or her practice and help addictions patients get well. It is a must read for every conscientious therapist.”--Bruce N. Eimer, PhD, ABPP, Board Certified Licensed Psychologist, Fellow, American Society of Clinical Hypnosis, author of Hypnotize Yourself Out Of Pain Now! About the Author: Joseph Tramontana, PhD has been a Licensed Clinical Psychologist for 43 years and has practiced hypnosis for the past 35 years. Dr. Tramontana is president of the Louisiana Psychological Association and of the New Orleans Society for Clinical Hypnosis. He is also a member of the Association of Applied Sports Psychologists.